Just like Darwin's finches, garments evolve and adapt as a class to new environments. A nice example is the duster coat. Originally this was a shin-length, unwaisted, lightweight coat that was worn while riding to protect the clothes underneath from dust (the Driza-Bone company of Australia still makes very handsome oilskin duster coats, but I reckon very few do any actual time on the back of a horse). With the advent of the automobile, the duster coat carried on its protective role, though now in the open seat of a roadster. When cars became sedans and road grime was no longer an issue for passengers, the duster coat underwent a peculiar yet perfectly apt transformation from the great outdoors into the dust-bunny strewn interior. 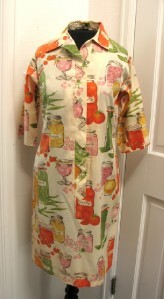 The 1940s, 50s and 60s saw its heyday as a front-buttoning, light cotton cover-up a domestic goddess would throw on as she set about her household duties. The term duster is now used interchangeably with housecoats and housedresses, especially when they appear as vintage collectables. I think the entire category is vastly undervalued -- many of these pieces are absolute treasures, especially those that for whatever reason saw little active duty as a functional cover-up. 1) Go for a great print, like the jam jar special at top. 2) There are a great many examples for sale at extremely reasonable prices. For that reason try to be patient and find one that's mint. 3) The simplicity of the cut of these garments means you can accessorize to the hilt--ideally with more modern pieces so as to avoid a Lucy Ricardo-style costume effect. 4) Consider wearing a great duster like the one at left over a sheath dress, or atop muted-color leggings, or unbuttoned over jeans and a tee . . . Fantastic post, Christa dear! Housecoats are long overdue for a revival! I'm often chilly (hubs on the other hand is a furnace year-round) and would like an alternative to a rob or heavy sweater to toss on when I need a little extra warmth. Wishing you a beautiful Monday & week ahead!